Portraits should be a reflection of your family- and your family is FUN! I want our time together to be relaxed and fun to show your family’s authentic self. Here are some tips to ensure a good time for our session together. Dad is dreading it, the kids are acting up- What’s a Momma to do when all she wants is pretty pictures of her family? Toddlers have short attention spans. I’m totally aware of this and I embrace it. We will play and interact a lot together. I want to make this fun for them too, and I really want to get genuine smiles from your littles, and that is the best way to do it. Take the time for yourself before the session. Choose an outfit or color that looks good on you. Then build the family’s wardrobe around your favorite item of clothing. Pamper yourself a little before the session if you can- just adding a few loose curls and natural makeup goes a long way in making you feel pretty and ready for your debut! We are going to move around a lot. Unless someone has mobility issues, we will walk, run, play, snuggle sitting on the ground and move around. Be sure to wear comfortable clothes that will allow you to move comfortably. And don’t do like I did and make your 4 year old son wear shoes that are too small “just this one more time.” It wasn’t pretty- his attitude or his blisters. We will do a mixture of traditional/posed images to warm everyone up. We’ll also do some of the kids by themselves, each parent with child, and some of you two lovebirds- Mom and Dad, where it all began. The majority of our time together will be spent interacting with each other, and not necessarily looking at the camera. We’ll play games and create meaningful connections. Last but not least- Don’t stress. If you come to the session stressed, the kids will feel your energy, and that will all show in your pictures. Try to be at your session a few minutes early to do any touch-ups or to wipe the peanut butter smear off your kiddos cheeks before it’s showtime. You’ll feel more refreshed and have more fun if we can just roll with it. It may not feel like the most glorious time of your life, but you are growing a miracle inside of you! I love working with expectant mamas because I love seeing that pregnancy glow- And I have never seen a mama-to-be without one! Find an outfit that flatters your bump and you feel good in. Most of the time I will suggest dresses because I feel they are universally flattering, but if you would rather wear leggings or jeans, rock on, mama! Choose a color and a cut that makes you feel like a queen, no matter what the current trends are. I have lots of resources to help plan your wardrobe. And don’t forget undergarments, like a supportive bra, that will work with your dress or chosen outfit. Take time for your hands. They will be in the pictures a lot. Just a quick diy manicure is fine- you don’t want chipped polish showing. We’ll go at your speed. I will choose locations that are safe and easy for expectant mamas to navigate, and we won’t do as much walking or moving around with you. Your comfort is my priority. You may want to bring a change of shoes. Some of my expectant mamas want to wear heels in the pictures but need to swap out into flats if we are walking to another spot at the location. Toss in a comfy pair of shoes if you bring heels. We’ll do a mix of you by yourself and with your spouse/family. If you have anything you would like to include in your session, such as an ultrasound picture or other sentimental item, let me know ahead of time so we can plan to work that in the flow of your session. Take the time to pamper yourself a little before the session. Feeling beautiful when you arrive at your session is just as important as the lighting or location. Lifestyle newborn sessions are held in your home, with your things and with the people that you love. It’s all about the cuddles and snuggles and life with your new little one! We’ll use 2-3 rooms of your home for the session, so be sure that those rooms have plenty of natural light and are tidy on the day of your session. I’ll ask that you text me pictures of these rooms prior to your session. I’ll start out by taking a little tour of your home to look for the best pockets of light. I may need to move things around a bit in the rooms that you have selected to maximize the natural light. Plan to feed baby just before your session time (10am). That way, baby is full and satisfied. We will feed on demand if baby requires it, and I’ll continue shooting during feeding time. I will bring soft, stretchy neutral wraps to swaddle baby. You may also use your own swaddles and baby clothes if you prefer. I won’t bring any other props to this session, and baby will not be posed naked, etc. This type of session is all about the family and snuggles. For wardrobe, I would suggest something comfortable and casual that matches with the décor of your home. We will be barefoot in most of the pictures (on the bed, etc.) so no worries about footwear. Neutral colors are always good. If you have toddlers or older children, they can pull a few things to use in the session. Reading books to their new sibling is a fun and easy option. Other children like to bring in their favorite stuffed animal or toy to “share” with the baby. Take a few minutes to pamper yourself before the session. Having a newborn at home is a big adjustment, and if you are like me- I struggled to get a shower for myself! Enlist some help so that you can feel your best for our session. 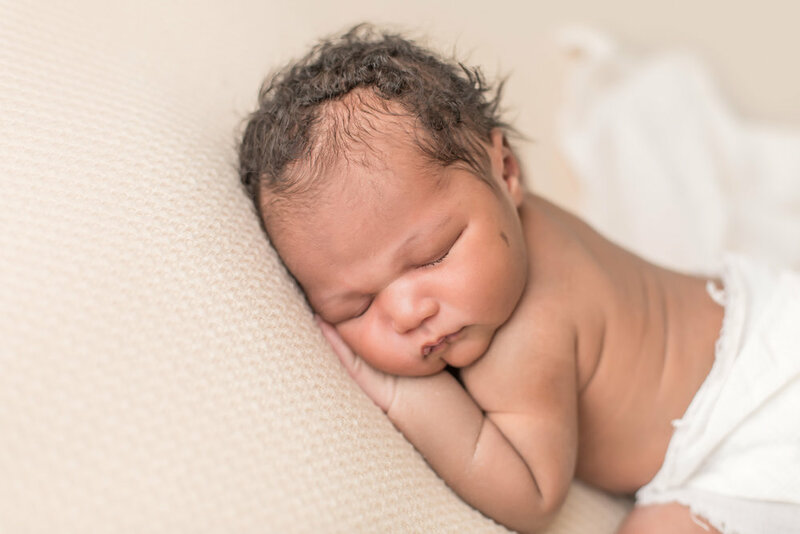 You can schedule lifestyle sessions up to 3 months old, so you may feel better to schedule your date farther out to give you more time to adjust to life with a newborn. 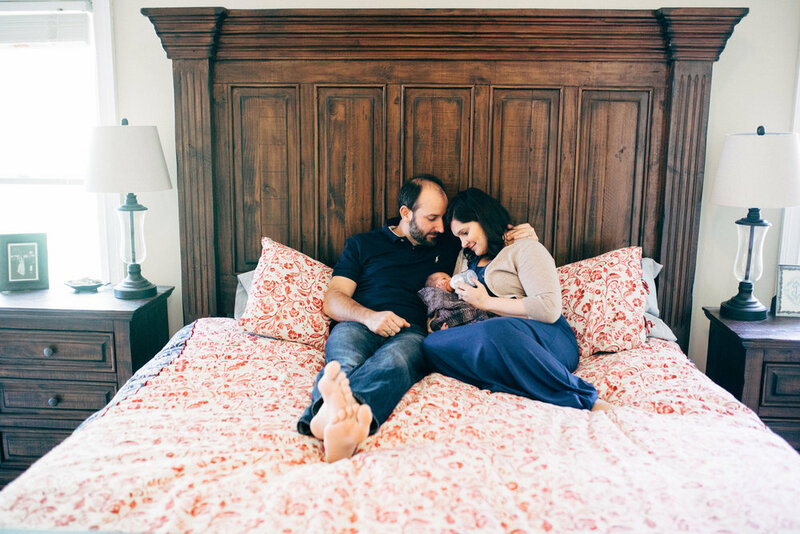 Some tips to make your studio newborn session run smoothly! Feed baby as the last thing you do before you leave your home. We will take breaks to feed on demand as needed. If baby comes in well fed and sleepy, we can get started shooting as soon as you arrive. Dress baby in a zippered or button down sleeper so we can take it off without going over his head. I will snugly wrap your baby in a swaddle for the session because it helps baby to feel secure and allows them to rest easier for the length of the session. The studio is all white with lots of natural light. I would recommend choosing colors that have some contrast to the white studio- blue and khaki are great choices that look great on everyone and contrast well with the white. Refer to your styling guide for other options- but I would recommend any color that looks good on you expect neon shades (harsh on skin tones) or everyone dressed in pure white. If mom is in white, put dad in a blue shirt, etc. We will shoot a mixture of lifestyle family images in the studio first - mom and dad with baby, mom with baby, dad with baby, entire family, siblings with baby- and finish the session with baby by himself. Ideally, the session flows better if baby is sleeping, so we will do things to help promote a sleepy environment for baby. I will keep them warm and bring white noise. A pacifier is handy if baby takes one, as well as extra diapers, wipes and anything you will need to feed baby. In the event that baby doesn’t sleep, we will continue with the session in a lifestyle format- baby being held and/or swaddled tightly. I provide neutral wraps and a beanbag for the portion of the session where baby is by himself. I don’t use props or big headbands- I just prefer the minimalist style to show off your perfect newborn baby. If you have items that you would like included, we will do our best to use those in the flow of the session if you let me know about them ahead of time. I do not pose babies in unsafe or uncomfortable positions. If you have older children, it is a good idea to bring a few things along for them that could entertain them during the second half of the session, after the family images are finished. A few snacks, a toy or an iPad usually works really well. Alternatively, dad or another family member could take the kids outside to walk around or to the park if the weather is nice.